ArcLight Cinemas, the longtime champion of creators and the ultimate destination for movie lovers, announced their newest film series featuring intimate screenings and conversations with 2019’s Oscar nominated composers for Best Original Score. 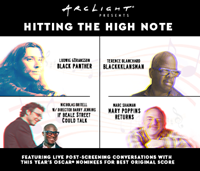 ArcLight Presents…"Hitting the High Note" offers ArcLight guests the opportunity to delve into the intersection of film and music with the maestros who orchestrate the musical journey to the directors’ cinematic vision. Each screening will be followed by a conversation with the film’s composer. “We are honored to collaborate with creators at the forefront of film and music. The love of film is what guides us to continue to bring such unique programming to our guests. This immersive moviegoing experience featuring this year’s Oscar®-nominated composers enables discussion about the intersection of film and music,” Kevin Holloway, Vice President of Film Marketing & Operations at ArcLight Cinemas, said. Since 2002, ArcLight Cinemas has been bringing the ultimate movie viewing experience to their guests. The first theater to introduce online reserved seating, ArcLight is at the forefront of creating a no hassles, no distractions environment. With no advertising, diverse programming, and the best in technology, movie lovers can fully immerse themselves in the world on screen. Movie: “Black Panther” —T’Challa, heir to the hidden but advanced kingdom of Wakanda, must step forward to lead his people into a new future and must confront a challenger from his country's past. Movie: “Blackkklansman” —Ron Stallworth, an African-American police officer from Colorado, successfully managed to infiltrate the local Ku Klux Klan and became the head of the local chapter. Movie: “Mary Poppins Returns” —Decades after her original visit, the magical nanny returns to help the Banks siblings and Michael's children through a difficult time in their lives. Movie: "If Beale Street Could Talk”—A woman in Harlem desperately scrambles to prove her fiancé innocent of a crime while carrying their first child. ArcLight Cinemas, a privately owned, Los Angeles based company, is a premiere moviegoing experience with an unparalleled commitment to bringing a variety of rich cinematic content to moviegoers in all markets. ArcLight Cinemas operates seven theaters in California including Hollywood, Pasadena, Sherman Oaks, El Segundo, Santa Monica, Culver City and La Jolla, as well as theaters in Bethesda, Md, Chicago and Glenview, Ill. A new location in Boston is planned for late 2019. ArcLight also owns and operates the historic Cinerama Dome and programs the TCL Chinese Theatre and IMAX in Hollywood. Additional information about ArcLight Cinemas is available at ArcLight Cinemas.